Today Berowra like most parts of Sydney is buzzing with cars. Our shopping centre and railway car parks are full to capacity a lot of the time. It is hard to imagine Berowra in the period shown in this picture from the 192Os. The photo is from the collection of the late Bill Foster who is shown as a child on the back of a much loved working horse, “Dolly”. 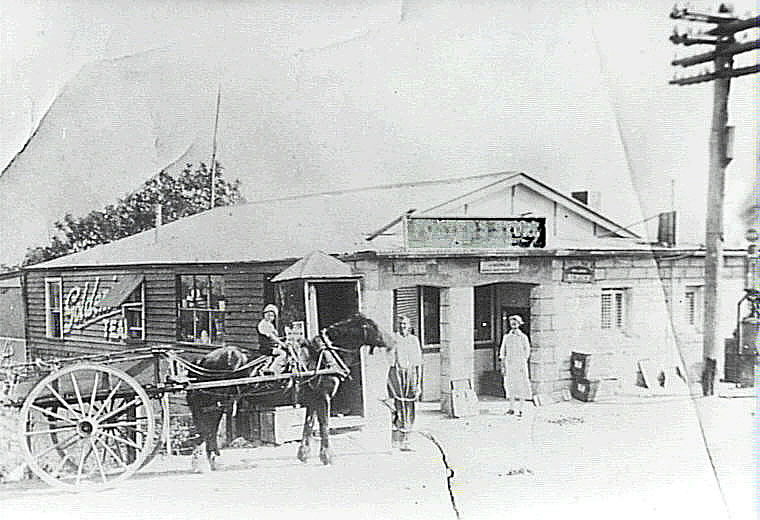 Bill’s parents have taken a moment from the hard work of running their general store near Berowra railway station, to pose for the photo. By the time Bill was in grades 5 and 6 at the original Berowra Public School, his father would drive the horse and cart up to the school at 3:30pm. Bill would then begin the afternoon grocery run, collect orders for the next day and twice a week take produce, mainly eggs, from the various local poultry farms to the railway station for dispatch to the markets in town. Along his route it was not unusual for young Bill to be offered a cup of milk from people, like the artist, Margaret Preston’s maid, Myra. At the end of the rounds Bill unhitched the cart and fed “Dolly”. Bill remembered his father always being most concerned about “Dolly” being adequately fed even in difficult times. Today, 1st August is the official birthday of all thoroughbred horses in the Southern Hemisphere while their cousins in the Northern hemisphere count 1st January as their birthday. We salute the working horses of Berowra and worldwide.